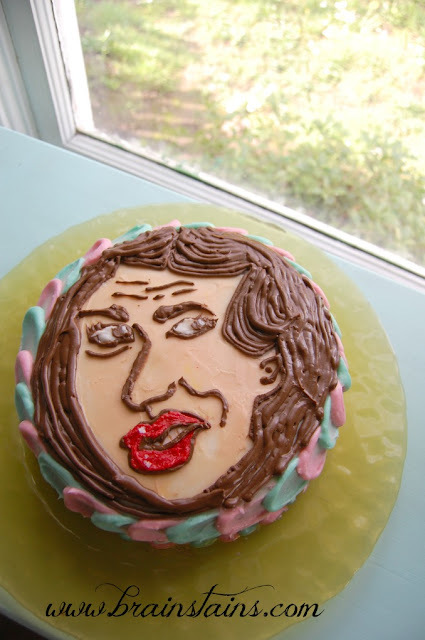 Hence the concept of a Miranda Cake was born. I usually have vague concepts when it comes to tackling something like this, and the internet yielded lots of inspiration for this etching of Miranda done in my basic buttercream frosting that I make using a combinations of memories from watching my mom, and intuition. I've been doing a lot of painting using acrylics recently, which surprisingly translated into frosting quite well, I also have to give credit to the cake videos Naomi and I watch before bed and nap sometimes. Watching "video cakes" as N calls it makes for lots of inspiration when it comes to frosting techniques. I took a beautiful Monday afternoon to sit down and frost my already baked cake. N was over at her Gram's house helping make family dinner, something we do every week with my dad, grandma, and great grandma. 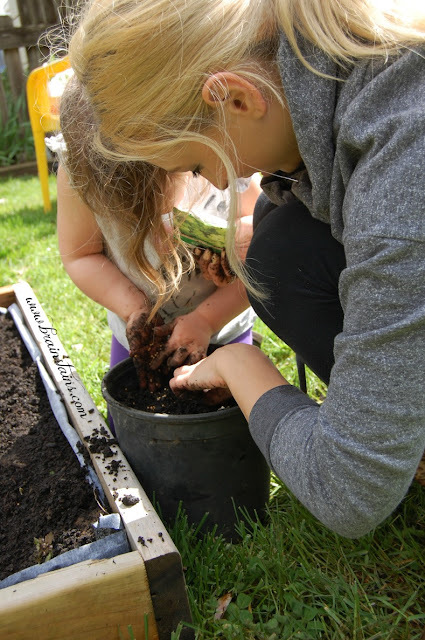 It's a awesome way to make sure she gets some quality time with at least three grandparents ever week, I want her to view spending time with her elders commonplace and expected of her. It's so important to me that she also grow up close to the matriarchs of her family as I did, chipping in on the cooking of our shared meals and helping to clear and set the table. I'm trying to raise a old fashioned girl with a fresh mindset. 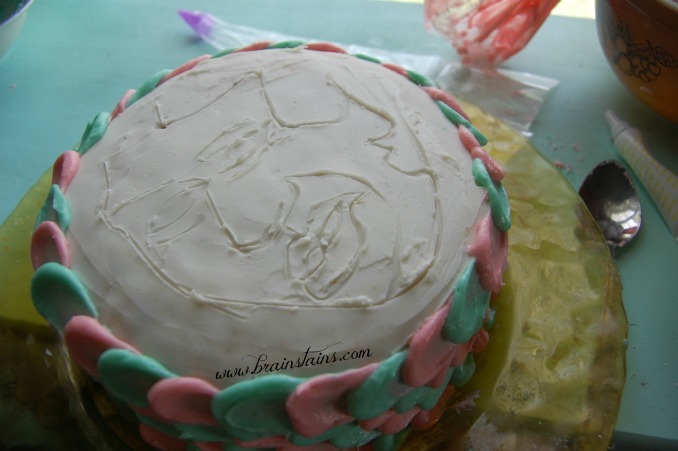 It also really helps to have a few baby free hours every Monday before supper to run around and complete and errands I've got to do, or to create a Miranda Sings birthday cake. 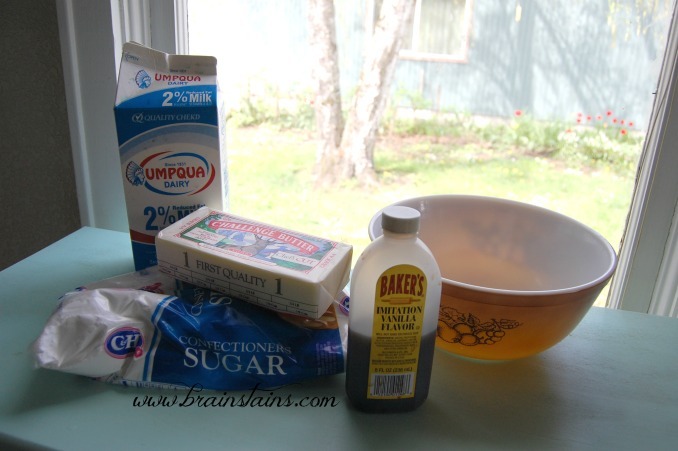 To start I use four simple ingredients, butter, milk, powdered sugar, and vanilla. 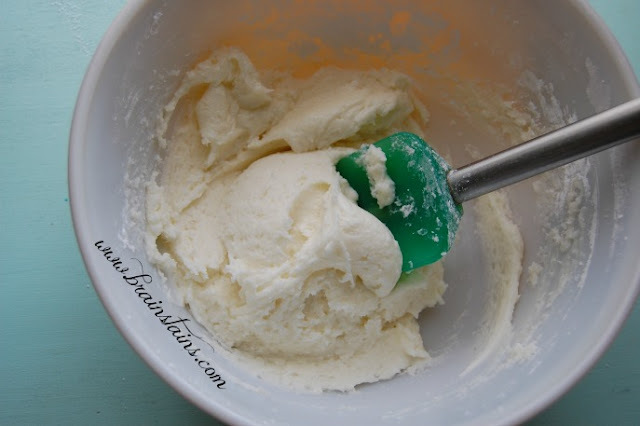 We're using imitation lately because the price of vanilla went up all crazy, like $15 unexpectedly and I didn't have that figured into my grocery budget at the time. 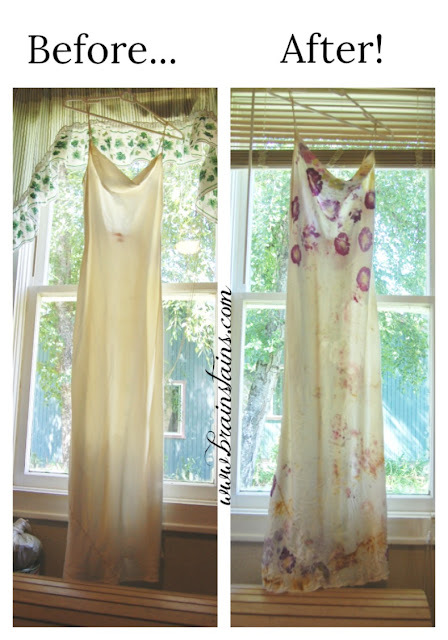 I'd love to make some myself eventually, maybe for my next DIY blog tutorial? I'll be posting the actual frosting recipe I used for this cake later in the week but until then check out some basic buttercream recipes on Pinterest if you'd like to whip this cake up. I currently don't have a mixer of any kind other than these guns. *insert eye-roll at self* but I'm happy to report this is easy enough without one. I always freeze my cakes wrapped in plastic wrap (ugh my planetttttt) which I feel awful about since I've tried to make my kitchen free of easily disposable plastic items, though I haven't thought of any alternatives for birthday cake prepping like this. 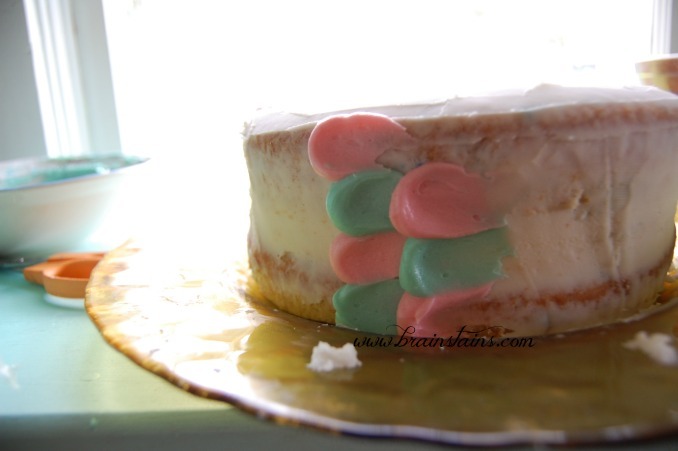 The reason I pop my layers, separately wrapped, then wrapped on top of each other, into the freezer is to give my buttercream a surface that won't peal right back up when I spread frosting on it. To start I place a big glob of buttercream on my cake plate, then squish my first frozen layer down onto it with quite a bit of force, making sure it's secure and I have a solid base. I spread a layer of buttercream on top of my layer generously and then position the next layer exactly on top, lining up the edges. You'll most likely have gaps, but that's ok! We can fill those in with more buttercream. I work in a circular motion to fill all the cracks around the sides of the cake, then smooth out the top as much as I can. After these steps I pop the cake into the fridge to set up for a minute. time to mix some colours! 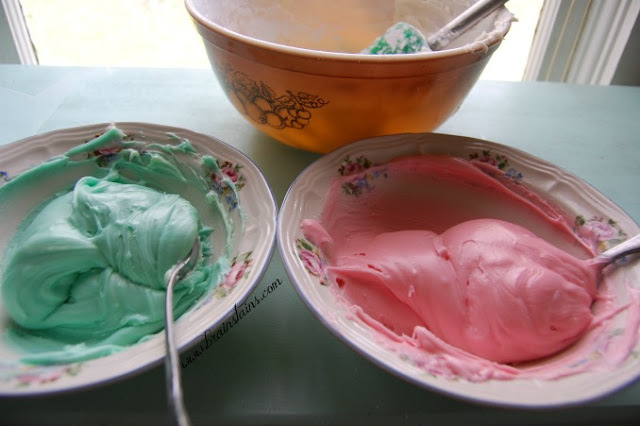 A general tip when mixing frosting colors, or any for that matter, is that less is more. It's a lot easier to just add more food colouring than to have to whip up more frosting if you end up with too bright of a shade. Since I was only doing the sides of the cake with colour, I left a equal amount of butter-cream white, to mix into the colours for Miranda's face. 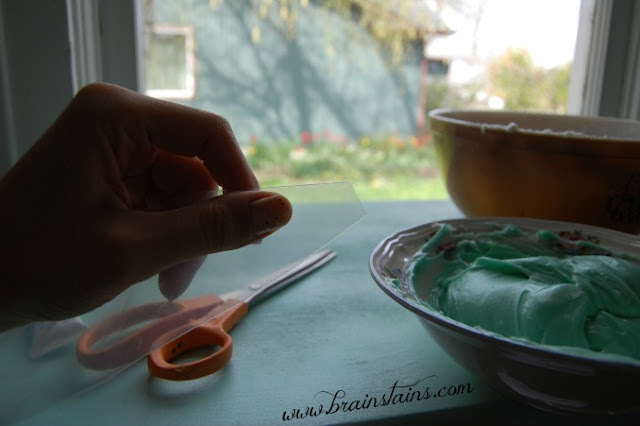 I cut my disposable frosting bag (cringes internally at use of plastic again) at about half a inch. I wanted to be able to create big dollops of frosting and this worked perfectly for what I'd intended. 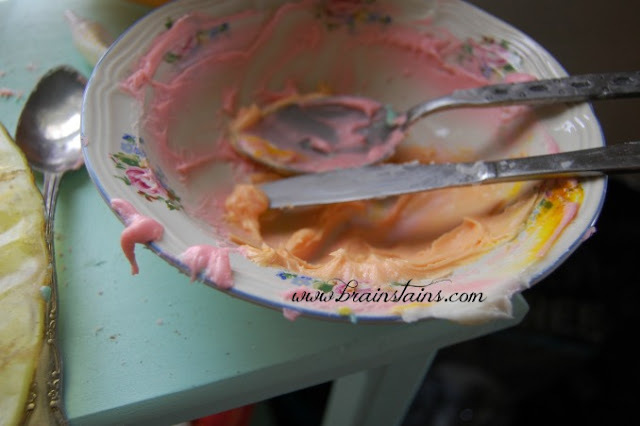 I spread each dollop out with a spoon, alternating colours to create a sort of scale looking pattern. It was my first go so didn't turn out quite as nicely as the ones on the cake videos, but I think it was a solid effort and will for sure be experimenting with this technique more in the future. Not going to lie to you the face was a little bit daunting to me at first, but I etched a very rough map into the top. 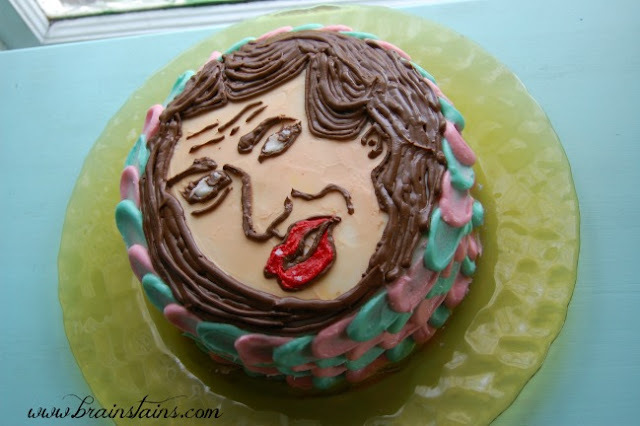 I don't think this is a very common cake subject, as I found no other tutorials on drawing Miranda, but there were plenty of pictures of her face on Pinterest to work from. To make a flesh colour I simply added some yellow into the light pink I already had going on. Light orange spread over the dirty iced white cake looked just like the skin colour I was going for. Mixing flesh colours can be hard, if it's too orange it kinda ruins the whole thing. My advice is to just be sparing and dilute with regular white frosting if you end up with a tone that's a little too "Trump" for you. I'm happy to report Kate was thrilled with her Miranda cake, her laughter confirmed the exact feeling I wanted to bring to her when I handed this over on her special day. I used a mix for the actual cake, as I'm really not that gifted in the kitchen. 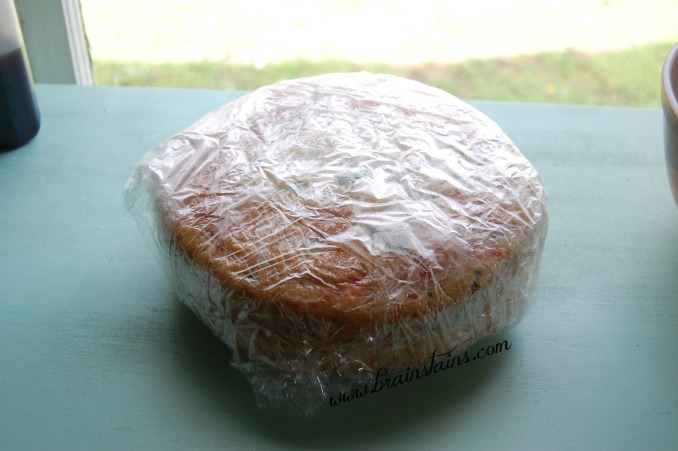 I have this theory that everyone secretly wants confetti cake on their birthday and doesn't even know it until they cut into any kind of cake. Confetti is just the most birthday cake of all birthday cakes if you ask me, and mixes work just fine. The one I used was only $.88 at Walmart, though I'm not seeing the exact one on their website. Oh wow this is insanely cool!